It’s the month of love and my half-birthday AND the Super Bowl (which is today! ), so the theme for February posts is ‘looking pretty’. Because that makes sense. Yes. 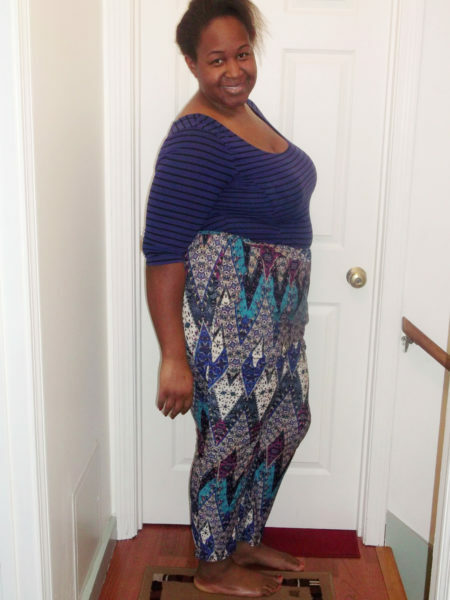 Back in January 2017, Alethia of Sew Much Talent (Sew Much Talent (GR) on Facebook) showcased her knockout version of McCall’s 6278 on Facebook. I couldn’t stop thinking about it, and then I saw Lekala 4228. It was close enough and I wouldn’t have to grade anything up. Win-win! 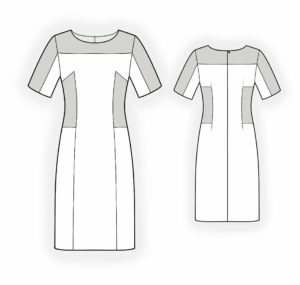 Interestingly, I found Burda 6540 which is almost exactly like Lekala 4228, which got me thinking maybe this is a staple sort of design that every brand has. 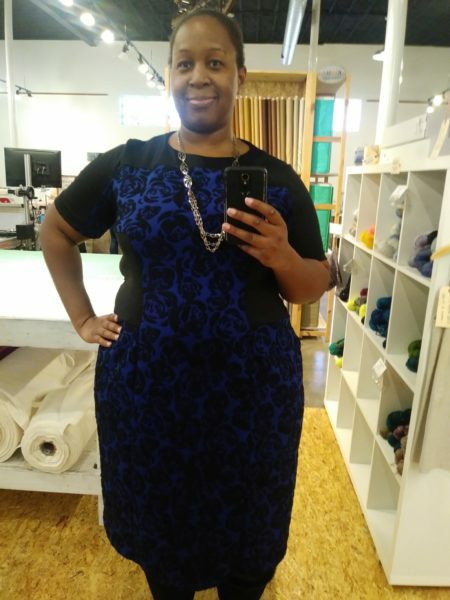 I’ve been tweaking my Lekala measurements since I created an account there for two reasons – one, it’s not a 1-to-1 relationship between your measurements and the finished measurements of your garments, and two, I’ve gained weight. 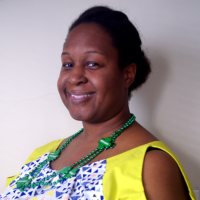 I know I keep harping on that, but … this started out as a body positive blog, among other focuses. So it would be remiss of me not to mention when and how I deal with body changes, which are the biggest challenge faced by body positive and non-body positive (?) people alike. I’ve yet to really get into how I feel about these changes; just not there yet mentally/emotionally. 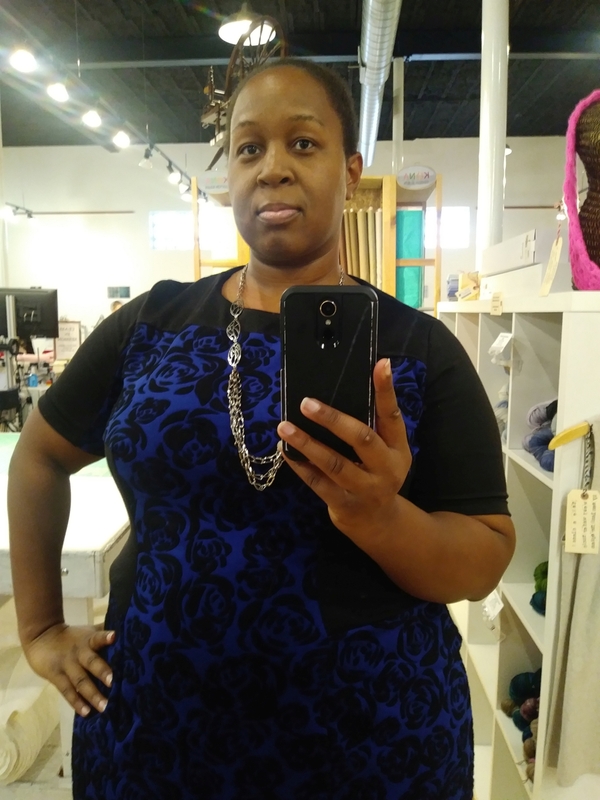 Anyway, the measurements for this dress were exactly the same as my super successful woven t-shirt except that I listed my height as 1 cm taller for the dress than the shirt. The length of the shirt was perfect, the length of the dress was too long. Coincidence? I think not. I’m not saying everyone should round down their height on Lekala, but consider how it’s distributed. I’m pretty short through the shoulder to the hip and only average length from hip to knee, which means that I need less length for every garment except pants. Lekala 4228 had a decent number of pattern pieces because of all the color blocking. 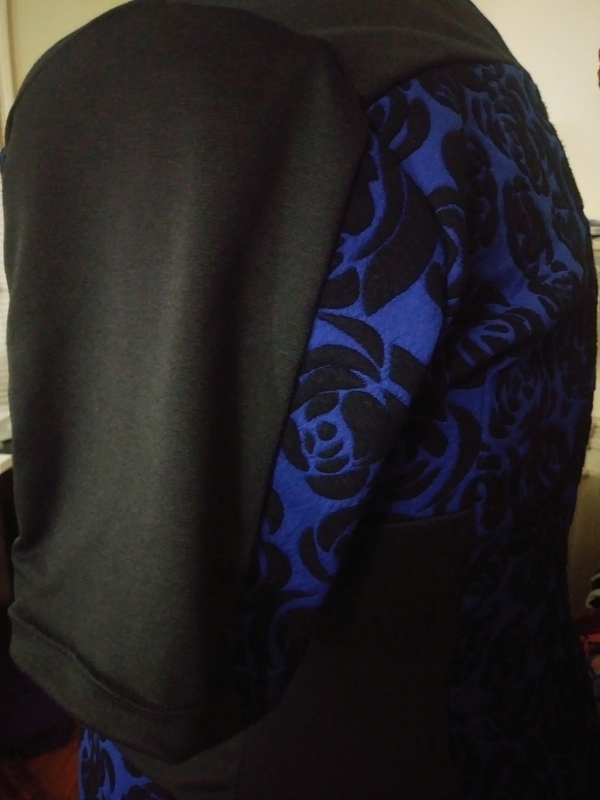 In fact, this was my first time ever cutting and sewing a three-piece sleeve! 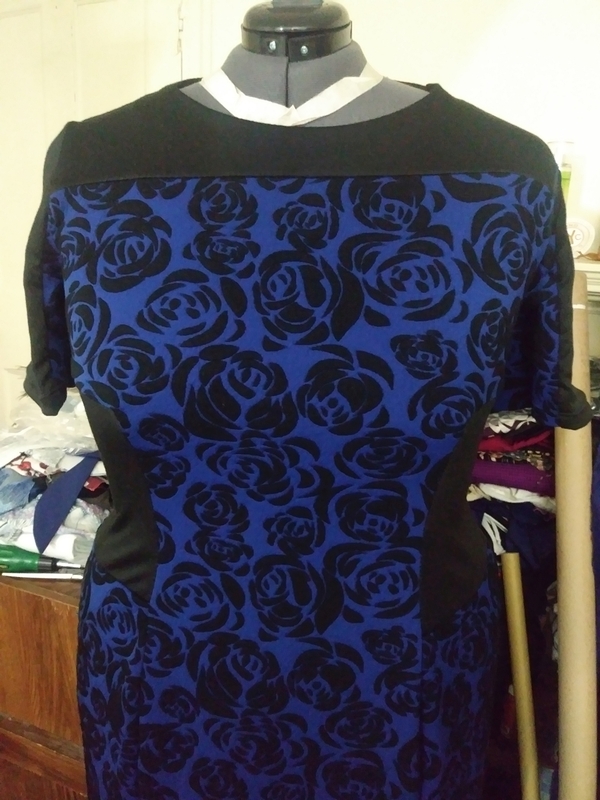 I did normal habit of labelling pattern pieces with name and direction in order to keep everything straight. And thank goodness I did, because I cut this thing months ago! I only recently grabbed all the pieces and sewed them together. 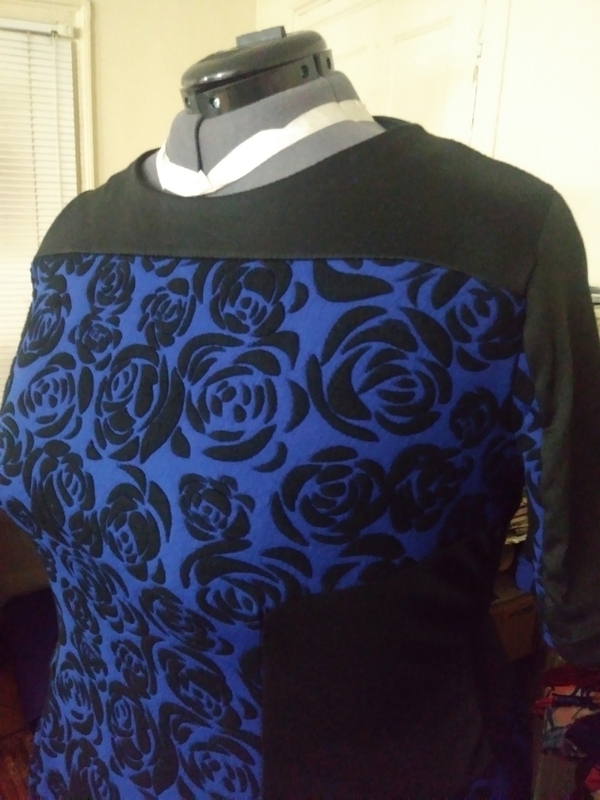 I couldn’t find the instructions, so I used my knowledge of sewing order and garment construction to git’er done and everything worked out smoothly. Another thing I do, specifically with patterns where I manually add the seam allowance, is clip all of them. 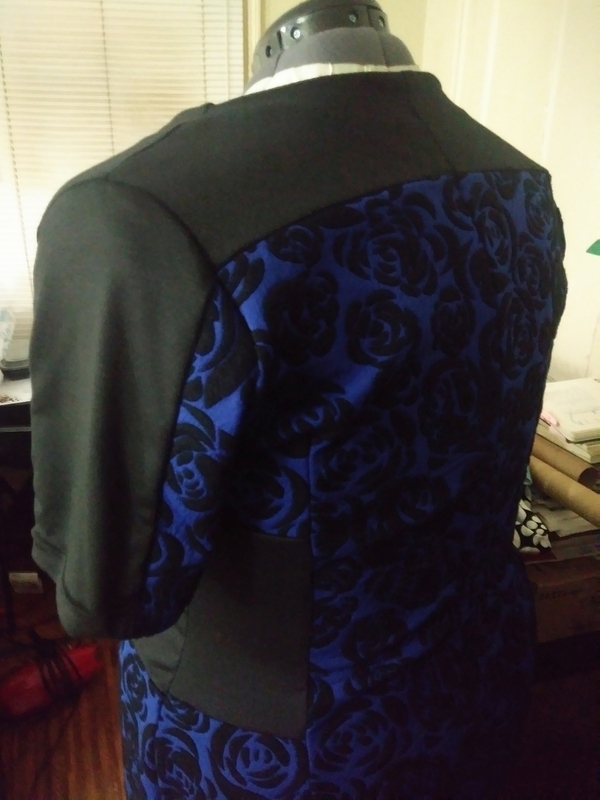 So when I come back to sew the garment weeks or months later, I can easily see what seam allowance(s) I cut and stitch everything accordingly. My sewing space is a pigsty and I forget things constantly, but I am a very organized seamstress! 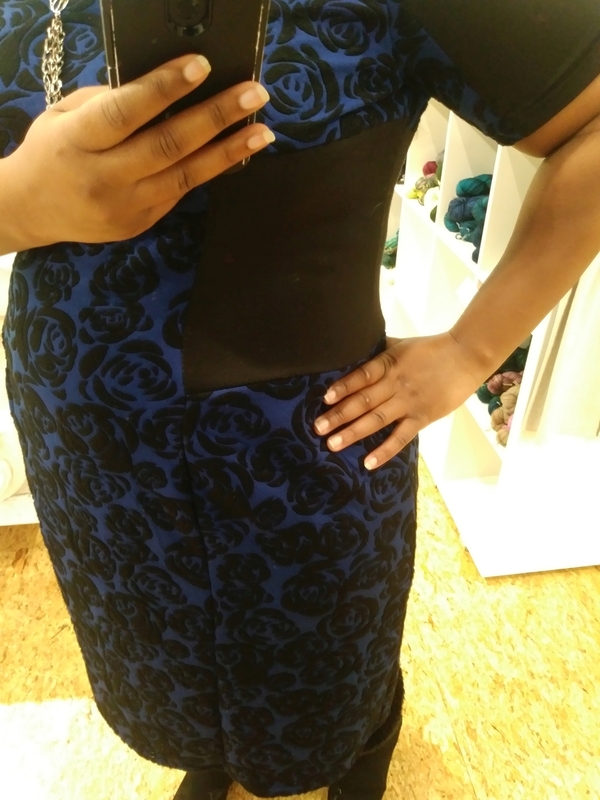 The fabric combo includes a delicious knit jacquard I bought while vacationing in Montreal on my birthday and some very ordinary black ponte. They were both very well behaved knits, but in a bid to use my serger more I serged all the seam allowances. Since I’d cut 1/4″ seam allowances I didn’t engage my knife – whew! Not a good look. Besides being pretty and easy to handle, the fabrics weren’t really noteworthy. Sooooo. 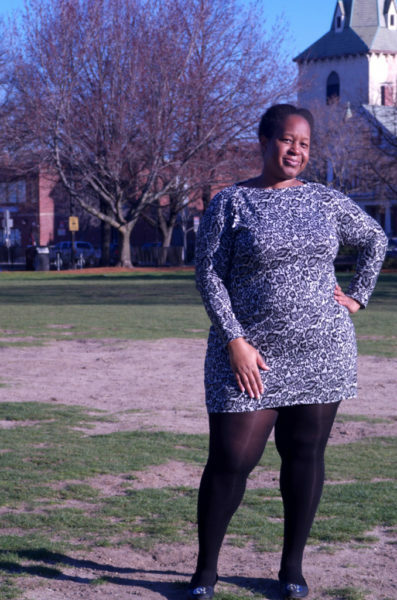 After this oddly technical post, can we talk about how much I love my new dress???? It’s so pretty and cozy and comfy and fits great – even though too long and too boxy, it still looks good. I will def make the necessary adjustments once I find the pattern pieces again, and I really want to make this pattern once more. 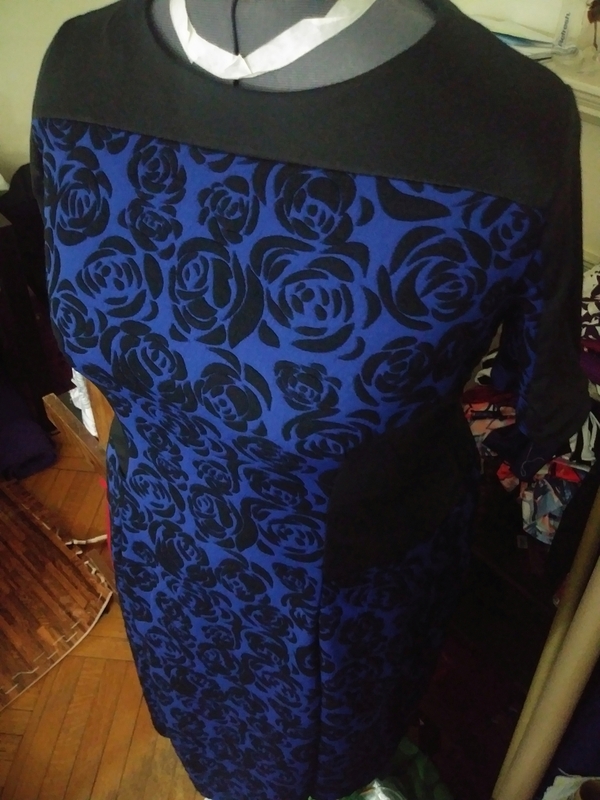 In the meantime, I’m planning on wearing this as much as possible while the cold weather permits heavier dresses. Love! Pretty! Ciao for now! love love love your fabric. Lovely dress and I have added this pattern to my wish list. What an adorable dress Ebi!!!! Love it!!!!! This is gorgeous and I love the color on you. So is a tapered hem kind of like a cocoon shape? 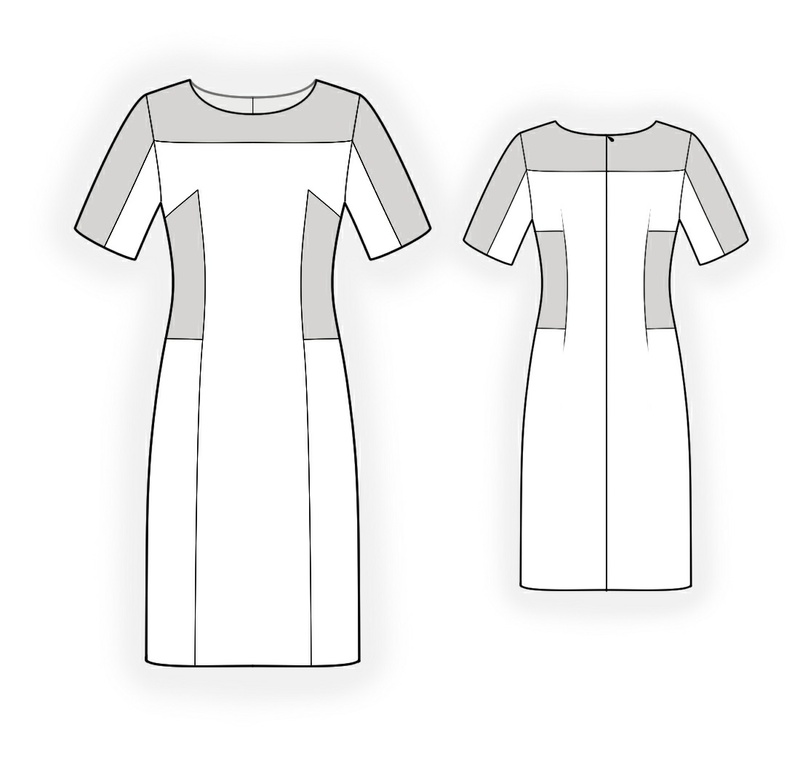 Slightly smaller at the hem than at the hips? Either way I think it’s great! Hi Paulette! You got it exactly right – a tapered hem does look like the bottom half of a cocoon. :) Thanks for commenting, and thanks for the kind words! Very pretty! 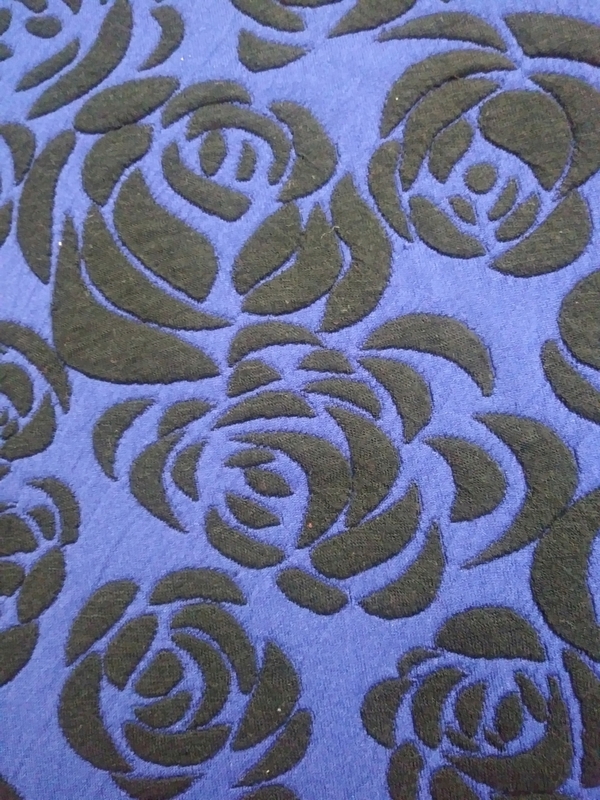 and that jacquard is GORGEOUS! Thanks, Tasha! It was a lucky find – almost didn’t make it home with me, because I was trying to be responsible. :-p Yay for reckless fabric shopping on vacation, haha. Thanks so much Monica :) Fiesta indeed! This is so nice. Great job!